Common law, also called Anglo-American law, had its origins in the courts of England in the Middle Ages. Deriving its name from its application commonly in all the King’s courts throughout England, it has become the dominant rule of law in countries where roughly one-third of the world’s population lives, including the United Kingdom and the United States. It’s critically important to genealogists because so many of its precepts explain why our ancestors did what they did, where they did it, how they did it and even when they did it. Everything from the age at which people could choose guardians, consent to marry, or make valid wills to who would inherit property if a decedent didn’t leave a valid will is governed by common law. And one man — English jurist William Blackstone — both reported on and shaped the course of the common law in his acclaimed Commentaries on the Laws of England. In Mr. Blackstone’s Common Law, we’ll look at some of these important legal concepts that shaped the records we use today — and at the man whose writings about them shaped the law itself. 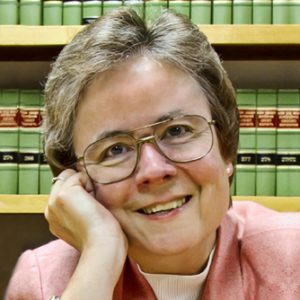 The Legal Genealogist Judy G. Russell is a genealogist with a law degree. She writes, teaches and lectures on a wide variety of genealogical topics, ranging from using court records in family history to understanding DNA testing. A Colorado native with roots deep in the American south on her mother’s side and entirely in Germany on her father’s side, she holds a bachelor’s degree in journalism with a political science minor from George Washington University in Washington, D.C. and a law degree from Rutgers School of Law-Newark. She has worked as a newspaper reporter, trade association writer, legal investigator, defence attorney, federal prosecutor, law editor and, for more than 20 years before her retirement in 2014, was an adjunct member of the faculty at Rutgers Law School. She is a member of the Association of Professional Genealogists, the National Genealogical Society and numerous state and regional genealogical societies. She has written for the National Genealogical Society Quarterly (from which she received the 2017 Award of Excellence), the National Genealogical Society Magazine, the FGS Forum, BCG’s OnBoard, and Family Tree Magazine, among other publications. On the faculty of the Institute of Genealogy and Historical Research, the Salt Lake Institute of Genealogy, the Genealogical Research Institute of Pittsburgh, the Midwest African American Genealogy Institute, and the Genealogical Institute on Federal Records, she is a member of the Board of Trustees of the Board for Certification of Genealogists®, from which she holds credentials as a Certified Genealogist® and Certified Genealogical Lecturer℠. Her award-winning blog appears at The Legal Genealogist website (http://www.legalgenealogist.com).